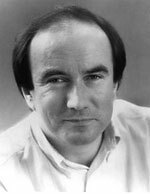 Richard Suart was born in Lancashire and studied at St John's College, Cambridge and at the Royal Academy of Music in London. He began his operatic career with the English Music Theatre Company and Opera Factory and is now much sought after, particularly in music theatre, contemporary opera and, of course, as a comedian in the more standard repertoire. Recent appearances in Britain include his celebrated Ko-Ko in The Mikado, Frank in Die Fledermaus and Benoit/Alcindoro in La Bohème for English National Opera. For Opera North he created the role of the team manager Stan Stock in Benedict Mason's Playing Away (also performed in Munich and Rotterdam), at Garsington, Don Magnifico in La Cenerentola and, as his debuts for both Welsh National Opera and the Royal Opera House, Jack Point in The Yeoman of the Guard. He sang in the British premières of Shostakovich's Cheryomushki and Param Vir's Snatched by the Gods and Broken Strings at the Almeida Festival. In recent seasons he sang in La Vie Parisienne with D'Oyle-Carte, Strauss's The Donkey Shadow with Sir Peter Ustinov and recorded Nicholas Maw's The Rising of the Moon and Holst's The Perfect Fool for the BBC. Productions abroad have included Donizetti's L'Ajo Nell'Imbarazzo in Batignano, Peter Maxwell Davies's Eight Songs for a Mad King in Gelsenkirchen, Milan, Helsinki, Strasbourg, Stavanger and Paris. Richard Suart sang Mason's Chaplin operas with the Ensemble Modern in Germany, Portugal, Holland and Austria and gave the world première performances of Snatched by the Gods and Broken Strings for the Netherlands Opera in Amsterdam and Munich. He sang Schoenberg's Ode to Napoleon with the Ensemble Intercontemporain at the Châtelet Music Théâtre, Paris and made his Malaysian debut as Ko-Ko. He sang Ko-Ko for Vancouver Opera and he made his Salzburg Festival debut in Ligeti's Le Grand Macabre. Richard Suart also finds time to present a highly successful one-man show titled As a Matter of Patter, an evening of predominantly Gilbert and Sullivan songs, dialogue and anecdotes, which he has performed with his wife throughout the UK, in Ireland, the Middle East and South Africa. He made his Proms debut as the Duke of Plaza-Toro in The Gondoliers (also televised) and is recently sang The Lord Chancellor in Iolanthe for D'Oyle Carte. Other recent appearances include The Mikado at ENO, Le Grande Macabre with Peter Sellars at Le Châtelet in Paris, Reigen Der Gatte in Holland and Of Thee I Sing at Opera North.